Breast oil cysts are benign breast lumps that usually don't require treatment. Similar to simple breast cysts, oil cysts are fluid-filled sacs that may feel smooth and squishy. Caused by the breakdown of fatty tissue, they often occur after breast surgery to either rule out or confirm a diagnosis of breast cancer, and hence, can be alarming. Other causes include trauma or bleeding disorders, though sometimes they occur spontaneously. They may be seen on mammogram, ultrasound, or breast MRI. Breast oil cysts can be left alone, or instead aspirated to remove the cyst. When large, painful, or if the diagnosis is in doubt, surgery may be done. 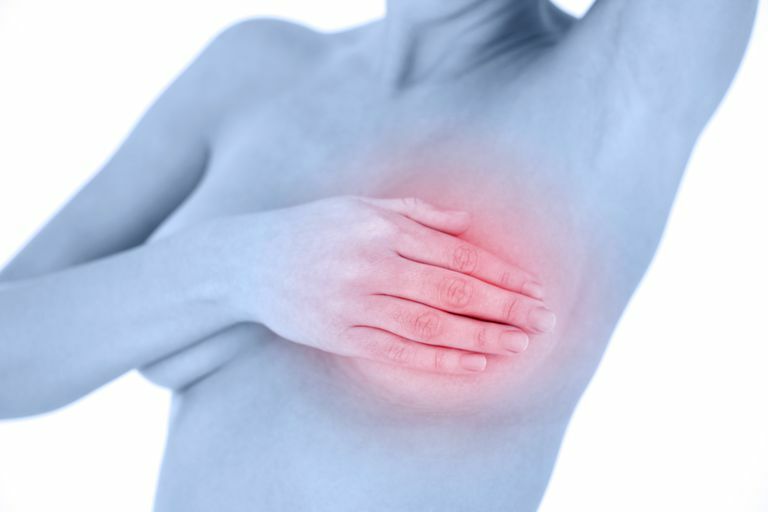 While breast oil cysts do not become cancerous, and do not increase the risk of developing breast cancer, in rare cases they may occur in association with an underlying cancer. Breast oil cysts are usually found on a self-breast exam. When they are small, they often go unnoticed, or may instead be seen on mammogram. Roughly 25 percent of breast oil cysts grow larger, and can be felt on exam as soft, squishy, and smooth lumps. They can be painful or painless, and may be associated with bruising if they occur after surgery or trauma. Breast oil cysts may occur after breast surgery, along with other breast conditions, or even occur spontaneously. They are called oil cysts because they contain a liquid form of body fat. If you have a lumpectomy or mastectomy, fat tissue may die as your body is healing and attempting to form a scar. Breast fat necrosis (the breakdown of fatty tissue in the breast) can form into hard scar tissue, or it can "melt." When "melted fat" collects in one area, your body may cause a thin layer of calcium to form around it. This eggshell calcification (the appearance of oil cysts on a mammogram) gives your doctor a clear idea of your diagnosis. Simple and complex cysts do not have the calcium layer, but oil cysts are usually enclosed partially or totally by calcium. Oil cysts often show up on mammogram as a well-defined mass that appears fatty, and eggshell calcifications may be present. These are different than the type of breast calcifications that tend to be associated with breast cancer. A breast ultrasound often gives a clearer picture of oil cysts than a mammogram. Ultrasounds use sound waves bounced off of breast tissues to create an image of masses, lumps, and cysts. Because cysts are filled with fluid, gas, or semisolid substances, they appear on ultrasound as dark, smooth-edged circular or oval areas. These cysts have a clear outline that distinguishes them from surrounding tissues. Other types of breast lumps will appear on ultrasound with different characteristics, although a seroma can appear identical to an oil cyst on ultrasound. Oil cysts will also show up on a Breast MRI. Oil cysts are benign—they are not cancerous, and they don't increase the risk or cause breast cancer. If you develop a cyst after a procedure such as a lumpectomy, however, it will be important to distinguish and oil cyst from a possible recurrence. There are several options if you are diagnosed with a breast oil cyst. An oil cyst may be left alone, as many of these will shrink on its own. If your oil cyst becomes physically painful or causes you worry or distress, it can be aspirated. Your doctor can use a very fine needle to suction the fluid out of the cyst, which will deflate it. Aspirated fluid from an oil cyst will be evaluated to make sure it doesn't appear bloody. Breast oil cysts may recur after aspiration, and the procedure may need to be repeated. If your oil cyst is painful, medications such as Advil (ibuprofen) may be helpful. You should also wear a comfortable bra or camisole. Using an ice pack may also reduce your discomfort. Breast oil cysts are benign, yet since they often show up after breast surgery—whether the surgery was just a scare or instead, a confirmation of breast cancer—they can cause a lot of anxiety. Mammography is the most specific test for breast oil cysts, but breast ultrasound or breast MRI may be helpful in making the diagnosis at times. Treatment options include "watchful waiting," aspirating the cyst, or less commonly, surgically removing the cyst. While treatment is not usually needed, many women (and men, since men can experience this as well) feel more comfortable with aspiration. With cyst aspiration, the oil cysts usually deflate, both resolving the cyst and the anxiety that can accompany having these cysts. Harrison, B., Dillon, D., Richardson, A., Brock, J., Guidi, A., and S. Lester. Quality Assurance in Breast Pathology: Lessons Learned From a Review of Amended Reports. Archives of Pathology and Lab Medicine. 2017. 141(2):260-266. Tassinari, J., Sisti, A., Zerini, I., Idone, F., and G. Nisi. Oil Cysts After Breast Augmentation with Autologous Fat Grafting. Plastic and Reconstructive Surgery. 2016. 137(1):244e245e.